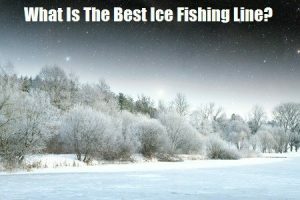 What is the best ice fishing line? When it comes to fishing, it is important to arm yourself with the best fishing tools. Securing the best ice fishing line ensures you do not give up your fishing interests during winter. Having excellent ice fishing line not only makes fishing fun, but also ensures you are successful in your fishing endeavors. Thankfully, manufacturers are constantly producing ice fishing line that not only gets the job done, but also improves your fishing skills on ice. Choosing the perfect ice fishing line is not as easy as most perceive, more so due to the several options available in the market today. 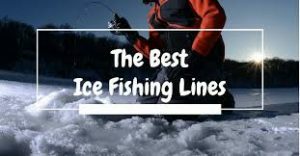 To help make the right decision, we will give you a systematic guide on how to choose the most appropriate ice fishing line while considering key features. Below are some important details on how to secure the best fishing line to enhance your fishing experience. Most fishing enthusiasts find it hard to distinguish between ice fishing line and regular line. Due to this, we find it necessary to shed more light on the key differences between the two. First, ice fishing line is designed to address line memory. Unlike regular fishing line, ice fishing line is treated with anti-freezing compounds which helps prevent fishing line memory. The anti-freezing components also prevent your line and rod from freezing. Another significant difference between both fishing lines is the dropping and reeling process. Unlike regular fishing line, ice fishing lines are made from fluorocarbon ends which makes them stronger and more abrasion resistant. The fluorocarbon material makes it easy to drop and reel the fishing line in ice without much resistance. When using an ice fishing line on an ice hole drilled by hand, the line will brush against the broken ice. This prevents the rough edges from damaging your line. The fluorocarbon material on ice fishing line not only enables the line to sink faster, but also reduces its visibility to the fish in range. When it comes to ice fishing line, the greatest challenge is identifying the most appropriate line to use. The three types of fishing line include monofilament, braided, and fluorocarbon lines. Monofilament line has a larger diameter. This line also has major stretchability that makes it easy to present wacky worms to fish, more so due to their much slower fall compared to other line. Unlike monofilament line, fluorocarbon line has impressive invisibility qualities which come to action when placed in water. Regarding strength, fluorocarbon material is much stronger in comparison to a monofilament line. The strength of a fluorocarbon line results in higher abrasion resistance. Consequently, this makes the line useful when fishing around sharp hole edges or heavy structures. Due to its built-in strength, fluorocarbon line is non-permeable to water, unlike the monofilament line which absorb water over time. A fluorocarbon line is also resistant to weather changes such as extreme temperatures, rain, U.V rays, and humidity. Weather changes cause the monofilament line to lose its strength and gradually break down over time. Another key feature that to consider when choosing fishing line is size, in terms of diameter and pound test. The type of lure you choose will determine the ice fishing line to use. Initially, lure designs were light, unlike nowadays where heavier designs have become prominent. Lures are made from tungsten, which helps straighten out fishing line. Thus, when choosing an ice fishing line, ensure it is heavy as this makes the line durable. A simple rule to remember is to always opt for tungsten lures with heavy ice fishing line. The diameter of the line is also important, more so when selecting a suitable fishing line based on size. The diameter affects the line’s stretch, castability, visibility, and the running depth of your lure. A fishing line with a small diameter is less visible to fish and helps impart a lifelike action to bait like crankbait and grubs which is vital in attracting fish. When acquiring ice fishing line, it is important to consider the color. The color of your line determines whether or not you will successfully catch fish in freshwater. Fish immediately get scared if they see a fishing line and react by swimming away. To avoid the disappointment of zero catches, be sure to select a fish line color based on the lighting conditions of your immediate fresh water surrounding. For instance, when fishing in low light conditions, at night, or early morning, you can opt for a high visibility fish line. Its high visibility will make it easier for you to see the fishing line. The visibility of your ice fishing line is important as it allows you to notice movement before feeling any bites. So when choosing a fishing line based on color, ensure you consider the environmental conditions and the goals you want to achieve. When fishing during the winter, the major concerns held by fishing enthusiasts is the durability and sensitivity of the fishing line. Fishing during the winter more often than not damages fishing line due to constant rubbing and friction against ice. If the line is not durable, it will easily break. This implies why durability is an important factor when buying ice fishing line. A durable fishing line makes it easy to angle when fishing during the winter. As a result, when choosing fishing line, always strive to balance between sensitivity and durability. Remember, a sensitive fishing line is not durable in the long term. Ensuring you strike a balance between the durability and sensitivity of your fishing line is the safest way to enhance your fishing experience. As much as it might be tempting to opt for a sensitive line, ensure you do not compromise on durability to prevent future disappointments. Line memory is arguably the most essential aspect of ice fishing line. 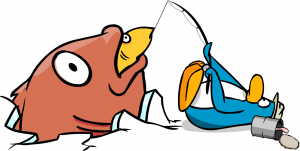 Line memory determines how fast you can deploy the fishing line without having to do it repeatedly. On top of saving time and effort, line memory also allows you to control the bait, and reel in fish with ease. Most fishing enthusiasts prefer a fishing line with a good memory. However, when fishing during the winter, a good memory is not an excellent trait for ice fishing line. Ice fishing line with an extremely good memory is likely to form springs and curl when cast. Ice fishing line with a low memory straightens out and makes the fishing line sensitive. Low memory also makes it easy to control the bait and reel in fish. Therefore, when considering the best ice fishing line for the winter, ensure you choose one with a low memory. It should also have a proper balance with sensitivity and durability to make it more effective. Once you consider the above features, you will have no problem enjoying fishing during the winter season. Sufix has a wide range of products and produce some of the highest quality spools in the industry. The Sufix Performance Ice Fuse Fishing Line is certainly the best line for ice fishing we have found in 2018. Everything about the product speaks of magnificent quality. First, the material is a combination of thermally fused line, together with a compound of HMPE Dyneema. What does this mean? It means the line is resistant to freezing. Moreover, it has practically 0% stretch and is highly resistant to abrasions and UV damage. The color is “smoke blue” which is suitable for icy waters – it blends in perfectly with the icy underwater background and fish will struggle to pick it out in the water. 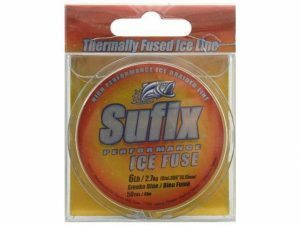 This particular Sufix Ice Line has an 8 pound test rating and is available in a 50 yard (or 68 meter) package. In terms of value and suitability, the Performance Fuse line is an absolute beast! Power Pro is another fantastic developer of quality angling accessories and gear. Their Power Pro Ice-Tec 50-yard 8 pound spool is certainly their best choice. It is designed specifically for icy conditions and as a result you can expect extreme durability and resistance. The material used is 100% Spectra Fiber which is a patented material by Power Pro which offers superb abrasion resistance. Furthermore, the material means that this spool has minimal water retention and will retain its integrity. The PTFE-coated line has minimal memory retention and allows for knots to easily be tied. Due to the composite, knots will maintain their shape and rarely come loose. 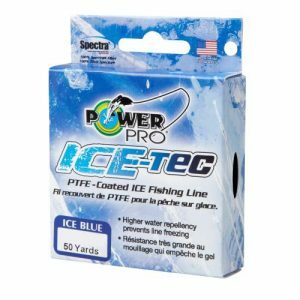 Available in an 8 pound test rating and a spool length of 50 yards, the Power Pro Ice-Tec is a brilliant choice. As far as braided products go, Piscifun has it locked down. Their Piscifun Braided Fishing Superline is exceptional. For those who love angling, this is a brilliant choice. The line is made from epoxy coated material which offers fantastic resistance to abrasion. It also makes the coating durable and resistance to wear and damage. You can purchase this item in either a 4 braid or an 8 braid configuration. The 4 braid configuration offers a pound test rating of between 6 – 50lbs. If you ramp up to the 8 braid configuration, you can enjoy a rating of 65 – 150lbs, no catch will escape! Aside from its great strength, the Piscifun product also offers minimal stretch and will cut through icy waters with ease. We have already featured one Sufix product in our top 10 list, but we could not forget to include the Sufix Performance 50-yard Tip-Up Ice Braid Line. The material of the Sufix’s line means you can expect unparalleled abrasion resistance. Furthermore, the line is unbelievably durable and gives one of the best diameter-to-strength ratios available. You may not believe how much strength such a thin line provides! What does all the above mean? It means you can use the Sufix Performance Ice Braid Line in icy conditions without any fear of damage or snaps. It handles magnificently in cold weather conditions but still allows you to bag the catch you want. As standard, you can purchase the product with a 20 pound test rating and an overall reach of 50 yards. Berkley offers a no-nonsense set of products perfect for a myriad of conditions and rod types. 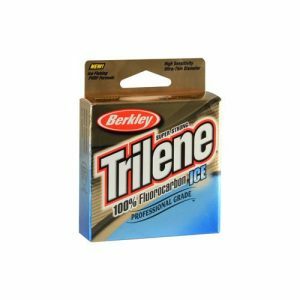 Their Berkley Trilene Micro Monofilament product is one of the best lines for ice fishing available. This item is created from a premium monofilament and offers excellent strength per diameter compared to other models. If you want to quickly hook up and start angling beneath the water, this accessory is perfectly suited – you can knot and attach the Trilene Micro spool in a matter of seconds with practice. Furthermore, due to the monofilament material and strength, you are given more control over your jig. For those who love serious angling in harsh conditions and rough terrain, the Berkley ice fishing line is our top-rated choice. It holds up well in adverse conditions and gives you no grief at all. Low memory is a vital aspect of an ice fishing line. If your line does not have low memory, it reduces the overall reach you can use. 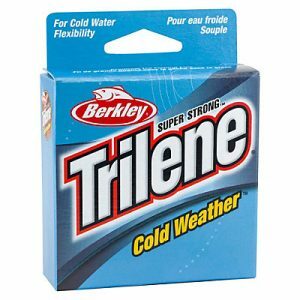 The Berkley Trilene Cold Weather Ice Line removes this problem and is classed as a low memory fishing line. It is widely known as a product with little to no memory at all – as you spool the material, it will retain its fluidity and give you maximum length possible. Berkely promotes this product as having the same flexibility at 32 degrees Fahrenheit as you would expect at 70 degrees – this is fantastic for cold water and icy conditions. Some models lose their flexibility as temperatures drop. Furthermore, the design of the line means that it has a brilliant low memory which is a bonus for deep cold water. Finally, the color is a striking bright blue – this blends in against surface ice and the watercolor so fish will struggle to see it. This is why this item is the best Berkley ice fishing line. 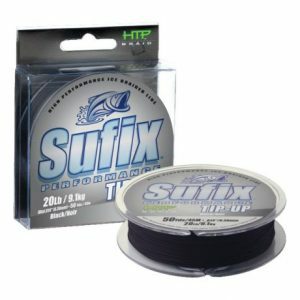 As our third and final Sufix brand item on the list, this product offers the strongest and most durable braided fishing line available. 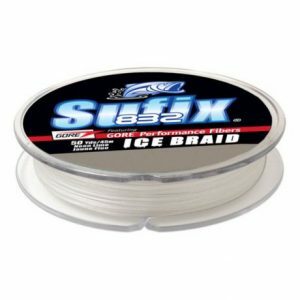 For those who want a big catch in the icy water, the Sufix 832 Ice Braid is available in a 30 pound test rating! Due to the braiding, this product is highly durable despite its relative small diameter. The braiding is made from 8 fibers using a patented Dyneema Plus 1 GORE material. The superior technology offers excellent strength for cost ratio. Furthermore, the Sufix 832 ice fishing line is available in 6 different strengths. The lowest pound rating is 4lbs and other ratings include, 6lbs, 8lbs, 10lbs, 20lbs and 30lbs. Due to its varying strengths and durable material, this is an excellent ice fishing line. If you want an excellent quality fluorocarbon line then the P-Line Floroice Clear Fishing Line is a marvelous choice. As the product is fluorocarbon coated, the material is practically invisible – fish within icy waters will not be able to see it at all. Furthermore, the coating means you can benefit from superior knot strength and durability. In addition to this, you don’t have to worry about it freezing or becoming brittle as the water temperature drops. The P-Line spool is available in a range of different pound test ratings. The lowest rating is 2lbs and you can purchase ratings of 3lbs, 4lbs, 5lbs, 6lbs and 8lbs. The standard spool length is a generous 100 yards. 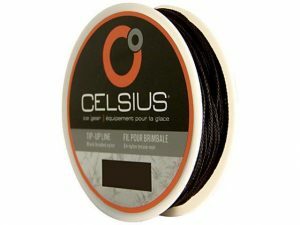 What makes this a great ice fishing line choice? The combo fluorocarbon and copolymer materials make it durable and resistant to cold weather. It is certainly a great fluorocarbon line for fishing in ice. When you purchase this fluorocarbon line you gain exceptional quality. You can purchase multiple packs of this product and save money through a bulk buy discount which is a nice addition. The material is a specially formulated of 100% fluorocarbon designed with ice fishing in mind. It has a fine diameter and gives greater control over your lure and rig. Aside from this, the thinness of the line means it is barely visible in the water – perfect for bagging those larger catches. A final point of note is the low memory. You will not experience annoying line coiling or unwanted memory when unwinding the spool. As far as Berkley Ice Lines go, this is right up there at the top. Celsius comes into our top 10 list with a tip-up product that offers up to 15lb pound test. The braided material is made from black nylon, meaning it won’t kink and the memory is extremely low. Due to these factors, the Celsius is the best tip up line in our list with amazing quality. You can purchase the line in either 15lb or 20lb test which allows you extra flexibility in what you catch. If you want a quality ice fishing tip-up line, this is definitely the wisest choice. When to use fluorocarbon fishing line? Fluorocarbon is a good general use line. Its construction and material means it is suitable for a variety of situations. Fluorocarbon is strong and resilient to both wear and UV damage. This makes it particularly suitable for ice fishing in cold conditions. Due to its makeup, Fluorocarbon is better suited in deeper waters – it sinks much faster than monofilament lines. Due to its fast-sinking nature, Fluorocarbon is not best suited to shallow water where you are surface fishing. 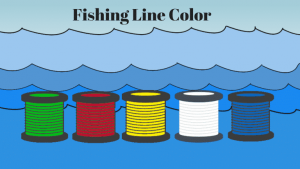 What is the difference between fluorocarbon and monofilament fishing line? The main difference between these lines is the material used. Furthermore, the two lines have differing qualities as a result. Generally fluorocarbon is stronger and more resilient to wear and tear. 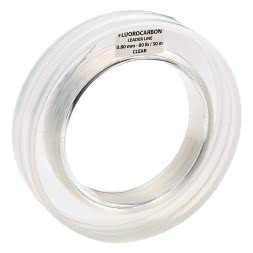 Moreover, fluorocarbon is resilient to water absorption whereas over time, monofilament can degrade and discolor. Both lines are available in a myriad of colors, but Fluorocarbon has a clear variant that is nearly invisible to fish. How much weight can fishing line hold? This depends on many different factors, different lines may have varying weight capacities. The common measure of weight is pound test – this denotes the strength/weight it takes for a line to break. Pound test ratings can vary between 2 to 400. How much weight your equipment can hold correlates directly to the pound test rating. For example, a rating of 8-12lbs means you can catch fish up to a max 12lbs – anything over this could result in the line breaking. How to tie fishing line to a reel? 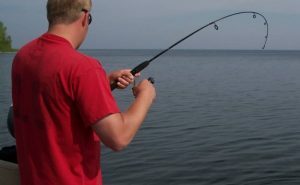 A line must be attached to your reel using a knot. The knot must be as compact as possible to avoid disturbing the flow of the line as it spools from the reel. We recommend using an arbor knot as it is one of the most reliable. This has a double knot which provides a double safety measure in the event the first knot comes loose. What is the best fishing line? 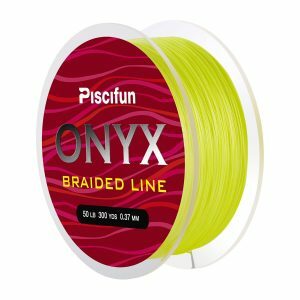 What is the best monofilament line? 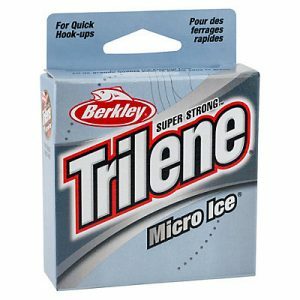 We rate the Berkley Trilene Micro Ice Fishing Line as the best ice fishing line from the monofilament lineup. As a premium product, you can easily fix the line to your reel and get set up in a matter of minutes. Furthermore, it features a superb low stretch design suitable for a solid hook-up. In doing so, it gives you greater control over your rig. With a 2 pound test rating, it is suitable for small to medium sized catches and the total length is 100m. For icy conditions this is certainly one of the best choices available. With a name like Flororice who wouldn’t want to use this excellent Fluorocarbon gear. 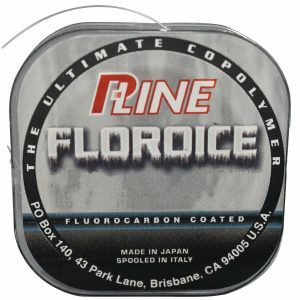 The P-Line Floroice Clear Fishing Line is a fantastic choice for cold water conditions and ice. Due to the fluorocarbon material, this line is practically invisible in the water – this gives you a greater chance of landing a catch. Moreover, the material gives superior knot strength and ensures the length doesn’t become frozen or brittle. It is made of copolymer with a silicon and fluorocarbon coating – this helps in freezing conditions. 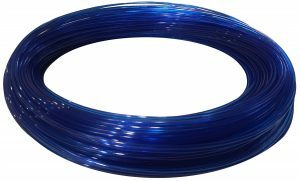 Fluorice Clear Fishing Line has a pound test rating between 2lbs to 8lbs and comes as standard in a 100 yard spool. For price and quality, Fluorice is undoubtedly one of the top fluorocarbon choices for ice fishing. 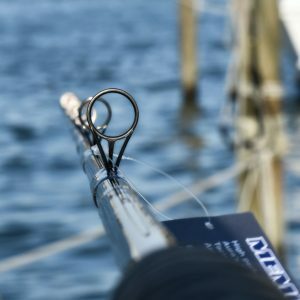 What is the best-braided line? 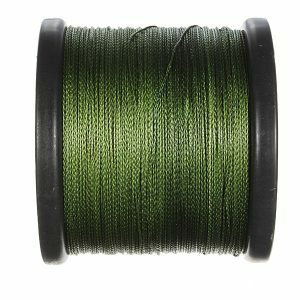 Piscifun has a reputation for making outstanding quality braided line. If you are looking for the best braided line, we recommend the Piscifun Braided Fishing Line 6lb-150lb Superline. The material is a combination of an epoxy coating together with high strength fiber. This results in exceptional strength and resistance – perfect for ice fishing. Furthermore, the configuration of the braids and material mean the line travels smoothly in the water – you will meet little resistance. There are two categories of pound testing – the lower category is between 6lbs to 50lbs using 4 braids. Alternatively, there is an 8 braid version that offers a pound test rating between 65lbs to a staggering 150lbs. This is a heavy duty line and easily the best braided line available. line is available in either 150, 300 or 547 yard lengths.